I’m SOOOO SO SO obsessed with top knots right now! Reasons I love them: Bad hair days are such a drag, but top knots make them actually something to look forward to! 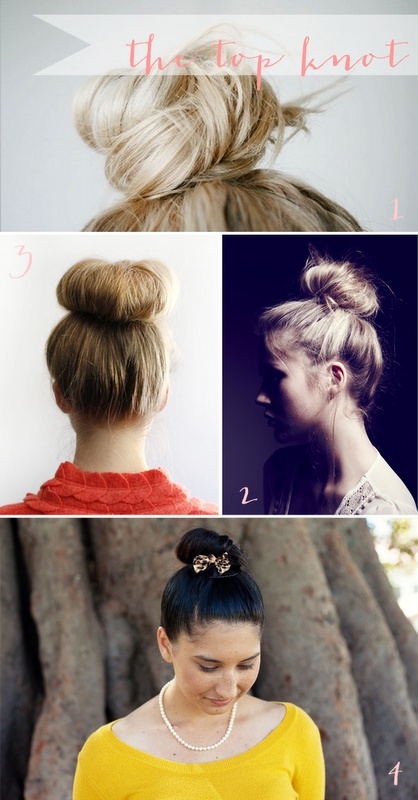 (well, sort of…) Another reason-no matter what your hair texture is, top knots are super easy and do-able! In my case, thin hair creates a small but sassy to knot. And lastly, they’re a cute and sassy way to pull of pretty, classy after-party hair. To style a top knot, I like to go with either some huge, pretty chandler earrings with pretty eyemakeup-sparkles or a cat eye. Another option is to wear an infinity scarf with some small, simple earrings. Basically, whenever you rock a top knot-ALWAYS wear earrings. Even if they’re baby studs, they pull it together. A tutorial for thin haired beauties trying the top knot will be posted later today! Posted on January 1, 2013 by flancake13	This entry was posted in Uncategorized and tagged topknot. Bookmark the permalink. ← #OOTD. Ringing in the New Year! !